Crusaders rounded off their title-winning season with a resounding 4-0 win over third-placed Glenavon. Paul Heatley scored two with Declan Caddell and Billy Joe Burns getting the others and after the match the Crues were presented with the league trophy. Former Northern Ireland striker Peter Thompson played his final match for Linfield in a 1-1 draw at Portadown. At the Oval, Glentoran beat Cliftonville 1-0 thanks to Fra McCaffrey's goal just before half-time. Next Saturday, Glentoran play Portadown in the Irish Cup final. There was a carnival atmosphere at Seaview as Crusaders celebrated their first title since 1997. They had the silverware in the bag before their final game against Glenavon and the visitors certainly did not spoil the party on the Shore Road, surrendering to a comprehensive defeat. Midfielder Caddell netted the opener after just one minute and Heatley, a front-runner for player of the year, quickly made it 2-0. Burns and Heatley rounded things off in the second half before Crues skipper Colin Coates was presented with the Gibson Cup. At Shamrock Park, 30-year-old forward Peter Thompson played his final game in a Linfield shirt in the draw against Portadown. 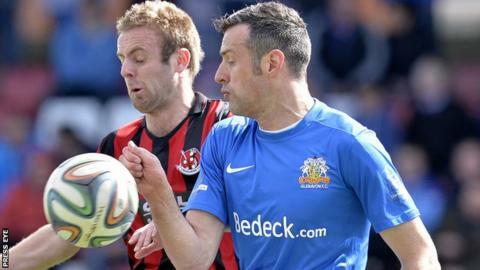 Thompson scored 230 goals in 418 games in his two spells with the Belfast club, but was recently informed he would not be getting a new contract at Windsor Park. The goals came in the first half with Darren Murray putting the Ports into an eighth-minute lead and Aaron Burns scoring Linfield's response. Veteran defender Ronan Scannell played his final game before retiring in Cliftonville's 1-0 defeat at Glentoran.